This is not a good place to find out about my recent and current work. Born 1936, QueQue Southern Rhodesia (now Zimbabwe). After a degree in mathematics and physics at Cape Town (1956) won a Rhodes Scholarship to Balliol College, Oxford 1957-60, to study mathematics. Became more interested in logic, then Philosophy of mathematics, and switched to philosophy. Senior Scholar at St Antony's College 1960-62. (DPhil completed 1962). For my last two years in Oxford I was a Senior Scholar at St Antony's College. Lecturer in philosophy of science at Hull university, 1962-4, then moved to University of Sussex 1964-91, apart from a year (1972-3) in Edinburgh converting to AI, as a result of a paper criticising Logicist AI at IJCAI 1971. At Sussex helped to start undergraduate courses in AI and later the School of Cognitive and Computing Sciences. Helped with development of the Pop-11 programming language the Poplog development environment and much AI teaching material. GEC-funded research professor 1984-6. Moved to Birmingham University as reluctant head of school 1991. (Ceased headship 1994). Officially retired 2002 but continued doing research as Honorary Professor of AI and Cognitive science. Since 2002: Honorary Professor of AI and Cognitive Science (officially retired, doing full time research). 1991-2002 Professor of AI and Cognitive Science, School of Computer Science, University of Birmingham. Born in Que Que (now KweKwe), Southern Rhodesia (now Zimbabwe), 1936. (BSc mathematics and physics 1956 1st class). Won a Rhodes Scholarship (SACS constituency) and went to Oxford (Balliol College, October 1957) to study mathematics, but eventually got seduced by philosophy after toying with mathematical logic for while, and was allowed to do a DPhil defending Kant's philosophy of mathematics (thesis now online): (DPhil 1962). For my last two years in Oxford I was a Senior Scholar at St Antony's College. Started teaching Philosophy at Hull University in 1962, then moved to Sussex in 1964. Spent 1972-3 in Edinburgh as Senior Visiting Fellow, and was converted to "AI as the best way to do philosophy." I learnt more that year than in any other year of my life since about the age of 4. Managed the development of Poplog, a sophisticated multi-language design environment, for exploratory research and teaching in AI and Cognitive Science, at Sussex between about 1980 and 1991. (Find out more about it here). Poplog won a UK Government 'SMART' award for Integral Solutions Ltd around 1991 for achieving sales of over 5 million dollars, and was the basis of the development of Clementine among other commercial products. Poplog is now a free open source system. I manage the web site. Obtained grants for development of poplog, and for research in vision. In 1984-6 was awarded a GEC Research Fellowship (not applied for). Grants from the Renaissance Trust supported my work. After 27 years at Sussex wanted a change so moved to Birmingham in 1991, when offered a research chair. Foolishly agreed (under strong pressure from VC) to be Head of School of Computer Science at first, but in 1994 became a research professor, working on architectures for human-like agents, a toolkit for exploring agent architectures, motivation, emotion, vision, causation, consciousness and related problems. Passed UK academic retirement age in 2001 but have continued to work full time, living on pension! 1991: Elected fellow of American Association for AI, (now renamed "Association for the Advancement of Artificial Intelligence") in 1991. (Second wave of elections.). 1999: Elected fellow of EURAI, (previously ECCAI) European Coordinating (first wave). 2006: Honorary DSc, awarded July 2006 Sussex University. Wrote The Computer Revolution in Philosophy in 1978 (freely available since Sept 2001, with notes and comments added from time to time). Miscellaneous online papers, discussion notes and postings to bulletin boards, etc. From about November 2002 I was actively involved in helping to define and promote one of the research Grand Challenges selected by the UKCRC, namely Grand Challenge 5 (GC5): Architecture of Brain and Mind, a project aiming to replicate an interesting subset of a typical human child (not a new-born infant) in a robot. (Since about 2008 this has been led by Leslie Smith, at Stirling university). My home page has further details. Prompted by Linda World, who was writing an article about me for the 'Histories and Futures' section of IEEE Intelligent Systems (published July/August 2005), I started to assemble a hypertext summary of things I've done and worked on. Inspired by reading Turing on Morphogenesis in 2011, started the Meta-Morphogenesis project to unify many things I had previously been working on. PDF tutorial presentation, for AGI, December 2012. 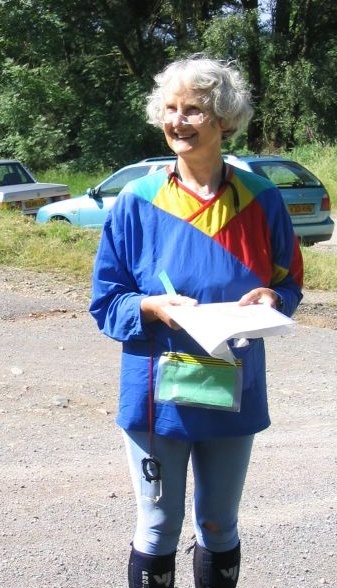 All of this would not have been possible without Alison (Shown at an orienteering event).